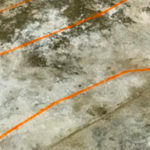 Using ground penetrating radar (GPR) to scan a concrete slab and locate radiant floor heat PEX tubing. 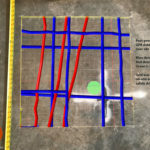 Results are marked directly on the concrete with this real-time 2D method. Rebar is also marked to help with drilling. 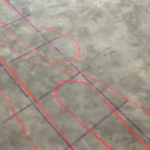 GPR is ideal for locating PEX tubes in concrete regardless if they are filled with air or water. X-ray technologies aren’t feasible for these slab-on-grade challenges. 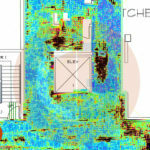 Accurate results with GPR for PEX are dependent on operator expertise and equipment quality. Concrete GPR LLC technicians have over a decade of experience, and use the most current digital GPR equipment available. 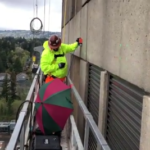 This project demonstrates how we can adapt to unexpected challenges, overcome them quickly, & keep your project moving forward on schedule & within budget. 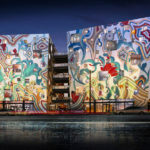 Concrete GPR provided advanced ground penetrating radar services to several trades during the construction of the Fair-Haired Dumbbell, in Portland Oregon. Concrete GPR rapidly produced detailed reports of underground sinkhole and voids under a concrete slab for immediate remediation and repair.